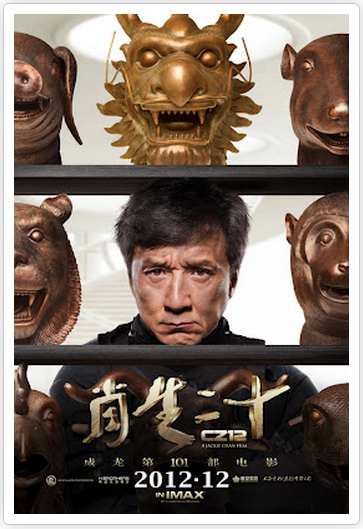 This entry was posted in Box Office Reports, General News, Opinion and tagged Avatar, China box office, Chinese Zodiac, CZ12, Hollywood studios, Huayi Bros, Jackie Chan, Lost in Thailand, Rob Cain, Robert Cain, Sony, Toyota by chinafilmbiz. Bookmark the permalink. Hollywood (and not PRC) has every reason to celebrate this film. It is a reinforcement of the proposition that storytelling and not mere production value is determinative. And if you notice, the screenplay credit goes to Jackie Chan, hardly a PRC writer! Until China embraces that storytelling is the number one indicator of viability, frees their writers to create w/o censorship and establishes systems to train and cherish writers, the PRC will simply not be globally competitive in making and marketing their films. Peter, have you actually seen this film? Go and watch it before making grand statements about artistic freedom and sound storytelling. It’s classic Chantastic (amazing action), but the dialogue is weak (minor flaw), the CGI is lacking (bearable), the dubbing is messy (obnoxious and confusing), the acting is forced (bearable, but taxing after awhile in such a long film) and the storyline sags under the weight of the pasted-on political themes (so boring). It seems very unlikely that the film in its present form could be screened anywhere in the West outside of film festivals or arthouse cinemas, and I doubt it would be interesting to anyone apart from die-hard Chan fans.